I initially planned to run an easy 20 miles today on the LoBo Trail. I say easy because that trail is so pedestrian and flat. I changed my plans last night though to instead run a real trail at Heil Valley Ranch. Running from the Wapiti Trailhead on the south end to the Picture Rock Trailhead on the north end, and back, is 18 miles and considerably more challenging. It will be nice to run a real trail again. I couldn’t wait to wake up and go Saturday morning. I start a bit before 10am. I don’t expect it to get overly hot and I am fairly well acclimated. I carry two liters of HEED sports drink in my Camelbak. I feel heavy starting out, but then I haven’t been running hills. This begins with 3 miles of moderate elevation gain. Nearly 1000 feet in 2.74 miles. I note as I struggle uphill that my legs don’t feel recovered from Friday’s run. This is odd because I only ran an easy 4 miler yesterday afternoon. My legs were sore last night too and I thought it odd at the time because generally I can run up to 8 miles and still feel fresh afterward. Still, it feels great to be running on this trail. I notice that while there are tons of mountain bikers, there are no runners. 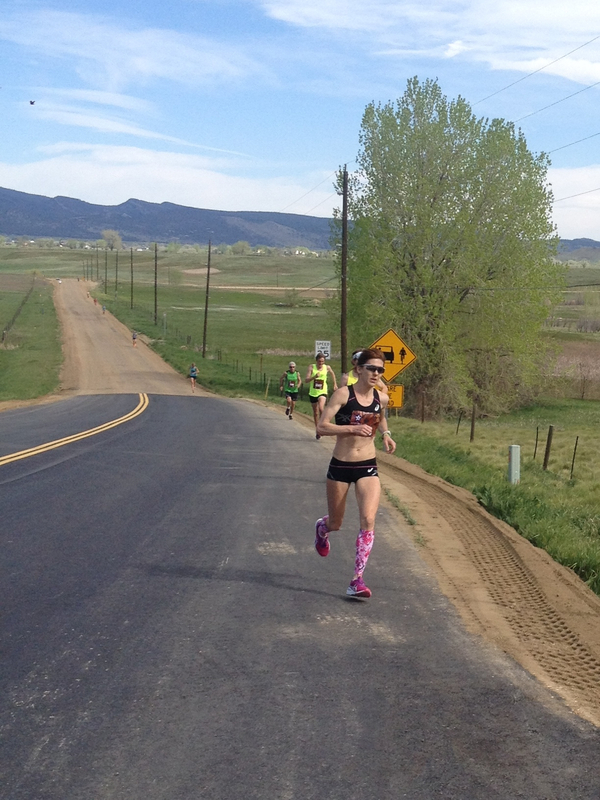 Everyone is likely training on the Boulder Backroads for the upcoming marathon. Whereas those roads are hilly, this is a mountain. They zig, I zag. I take it slow though, which is my plan considering my 18 mile target. I maintain a slow pace as the trail begins the six mile descent down to the Picture Rock Trailhead. Not slow enough apparently as I trip at mile 5.25 and crash into the ground. Runner down! Falling forward with 6 miles per hour of downhill momentum is a bad scenario. I’m drinking from my camelbak at the time, which is likely why I lost focus. I’m just barely able to thrust my hands forward into a large but flat surfaced rock to break my fall. The rock angles upward so my hands slide forward and I rest on my forearms – in sort of a pushup position with my torso never hitting the ground. Until I rest on the ground of course for five or ten seconds. The sliding motion likely spared my wrists or arm from breaking, but my palms leave behind measurable DNA on the rock. And they really hurt. I continue running, but more slowly. Either my trail legs are out of practice, or I’m super fatigued. I recount the fall and consider how lucky I am I didn’t break my wrists. 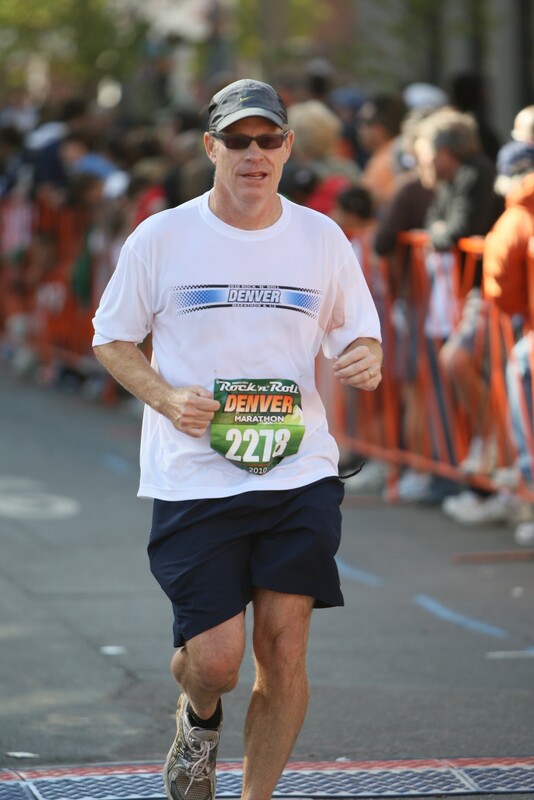 I can run the Boulder Marathon in five weeks with broken wrists. Broken ribs would have ended my running season. I reconsider the wisdom of training on the safer Boulder Backroads. I’m wearing my Garmin but never look at it. I find out after uploading the results later that I’m running over a 10 minute pace – even downhill. That’s unusually slow for me, but perhaps understandable given my near death experience. Despite my deliberate pace, I continue to stumble fairly often. This hurts my toes and I shout out with screams that echo off the mountains. I finally encounter another runner, a girl perhaps in her 30s, running in the other direction within a mile of the trailhead. I wonder how far she is going and when we will cross paths again. I reach Picture Rock Trailhead in a little over nine miles and turn around. This begins a six mile climb. I feel weak but pass several bikers on the ascent. I begin to wonder after only a mile into this climb if I can continue without walking. My strength is seriously fading. I begin walking after two miles. I figure I will start back up once I catch my breadth. I never catch my breadth. To be fair, I’m walking well under a 15 minute pace uphill, but this is strange. I figure worse case, I’ll walk the entire climb and run again on the nearly 3 miles of downhill into the trailhead on the other side. I note that my head and face feel cold and clammy. I try to run occasionally but can never maintain it for more than 50 yards. I don’t believe it is overly hot and also think I’ve been disciplined in drinking my HEED. My rate of stumbling becomes worse and I even begin to feel dizzy. My shouts of pain that accompany each stumble are now joined by raging expletives. I’m in a foul mood. At 15 miles, nearly to the top of the hill, I begin vomiting. This makes me feel a bit better, although my legs and arms shake involuntarily for several minutes after I continue walking. My symptoms do resemble heat exhaustion and dehydration. I suspect I’m sick though. I feel sick. I try running again on the downhill but can’t. In fact, my pace slows down even more, despite the easier grade. Fortunately there is a bathroom at the trailhead because diarrhea hits me at the end of my run/walk. I rest for about 15 minutes before driving home because my legs are cramping. Despite laying down on a picnic table, I never catch my breadth. Not until I vomit again does my breathing settle down. I’m still in bed hours later. Karen thinks I over did it. I think I’m sick. Runner down! I returned to the Picture Rock Trail Head to run some hills in preparation for the Flaming Foliage Relay. Generally I access the Heil Valley Ranch trail system from the Wapiti Trail off Left Hand Canyon. It’s closer to my house and only 2.5 miles up. Picture Rock Trail is over 5 miles up, but that’s the point. Today’s run included Keith and Steve, both on my relay, and their buddy Tom pictured here. 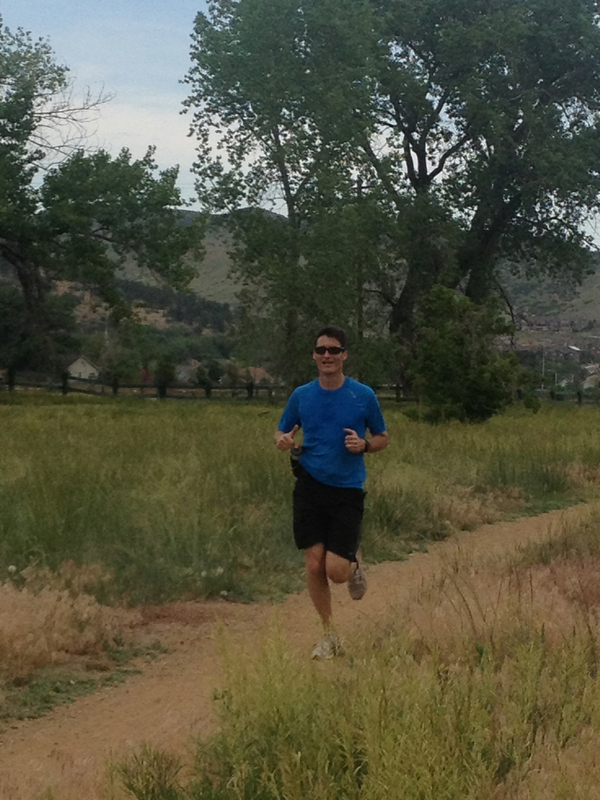 He’s running yet another relay across Colorado with Keith and Steve in about 4 weeks. All of us need hill training to prep for our relays in the mountains. Before starting up the hill, nearly 20 runners ran by us. They were men, seemingly in their mid to late twenties. They emerged from the trail head onto the road. They were apparently training on a more flat loop through Lyons that mixed trail with pavement. They were soon followed by a group of 10 or so women runners. We saw these women on the highway while driving to the trail head. This gave us a good sense of their course. These runners all looked elite. Or maybe all youth looks elite to me but they were running a good clip. The men’s squad had a few falling behind on the strong pace. I wasn’t able to find the time to run Saturday and I think that made me refreshed for today. I led us up the hill and felt strong. The cool thing about this trail is that even though it goes uphill forever, the grade is manageable. Even for mountain bikers. Oddly there were more runners than bikers on the way up. Generally this is a mountain biking trail. Keith and I reached the top first. This is the point at 5.5 miles where the Picture Rock Trail intersects with the Wild Turkey Loop. It continues rising for another half mile for runners who haven’t had enough punishment. We stopped here per plan and waited for Tom and Steve. Before they joined us, Keith and I chatted with a mountain biker who was resting. I didn’t catch his name but he was in his 40s and nursing a torn achilles tendon. 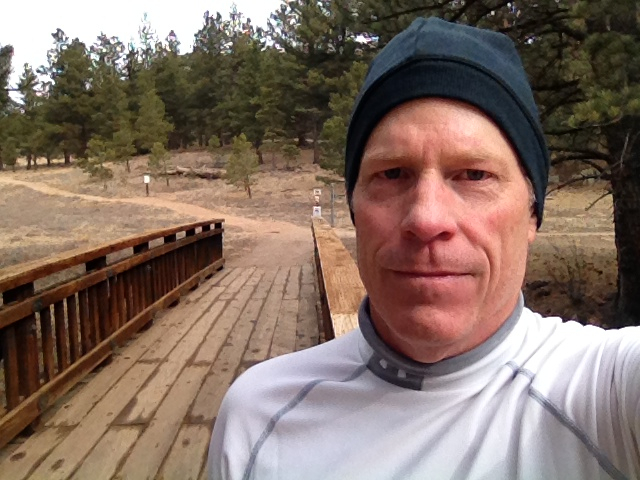 He related the story of how he ripped it apart trail running in Estes Park. His subsequent surgery included replacement parts from a cadaver. Thank God that stuff only happens to others. Tom and Steve had less time to recover before heading back down. I’m certain Steve wanted more time, but I felt like pushing him. The boy needs to get serious about his training with all the events he has planned. Invariably, my strategy on this trail is to get my workout on the way up and not worry about speed on the way down. I flew down fairly fast anyway because I had time to fully recover and felt strong. Tom followed me. Not sure of his conditioning but his ability to hang was probably more related to having experienced trail legs and confidence in his footfalls. I slow down on this trail when I feel fatigued because it’s treacherous. Anyone familiar with this trail has their share of stories stumbling over the rocks. I fell once so hard I bounced up a foot and a half into a thorny bush, which was fortunate despite the thorns as it kept me from tumbling down a steep hill. The biker situation was completely different on the descent. We must have passed, or been passed by, 30 mountain bikers. It didn’t annoy me as much as it does other times. Perhaps because these bikers were mostly experienced and passed by without too much impact. Or, even though I was running strong, I wasn’t intent on racing and didn’t mind slowing down to let the less experienced bikers pass. It’s rare I feel this strong sinking back to the bottom of a 5.5 mile ascent. I credit both yesterday’s rest and the long wait for Steve at the top with allowing my muscles to recover. I would normally slow down the final 2 miles on Picture Rock Trail regardless of fatigue out of respect for the rocks and memory of past spills. Click on this pic of Steve to get a view of the rocks. I might have got caught up in racing the bikers. I pushed it all the way down, with Tom close on my heels. 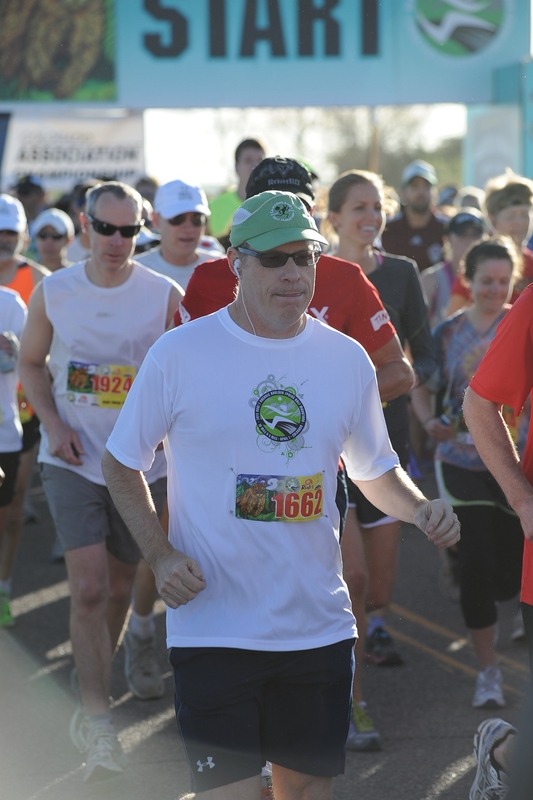 He passed me near the end as I elected to cool down the final half mile. The weather actually cooled off during the run which may have also contributed to the fast descent. 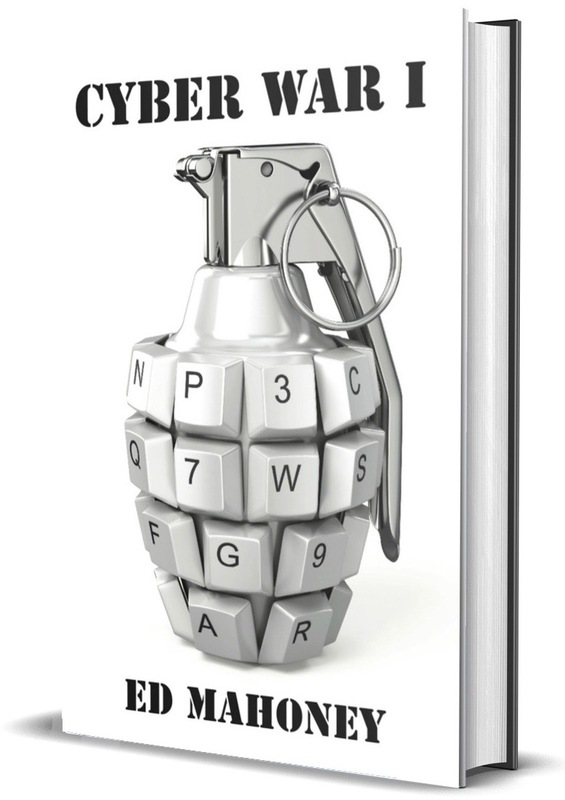 Nothing’s hurting a few hours later as I blog this. Really nice run for Father’s Day. For my last run of the year – Lady Bird Lake in Austin. The old Town Lake setting is always enjoyable and a great venue to end another year of running. As I think back, these are my coolest runs of 2012. Moab. If you haven’t run Moab, or hiked the area, or mountain biked on the slick rock, you’re missing out on one of this country’s premiere outdoor locales. CPTR. The 25 mile Collegiate Peaks Trail Run is such a nice experience. The views don’t get any better. But I think it was the friendly participants and general atmosphere of Buena Vista that make this event worthwhile. IPR. I’ve run the Imogene Pass Run twice now. At 17 miles, it appears more doable than a marathon. More like a half marathon. But trust me, your time will be slower than what you can run for a marathon. This run only has one hill, but it’s ten miles up and seven steep miles down. Easily the most challenging trail I’ve ever run. Barton Creek Greenbelt. I just ran this trail the other day for the first time in over 20 years but used to run it regularly. I’ve yet to discover a comparable inner city trail run. Boulder County. I’m lucky that I live here. I’m partial to the East Boulder/White Rock trails and Heil Valley Ranch but there are countless trails in the foothills of the Front Range. And I’m fortunate to have the LoBo Trail out my front door that I run to Niwot and back on most days. About time Colorado cools off to winter status. Although the only reason it was cold enough in this pic to wear tights for this year’s Colder Bolder 5K was that it was early morning. I love it when I get a race pic with both feet in the air. It’s right up there with getting a pic that doesn’t show a double chin. Click on the pic to enlarge it if you need to in order to see both feet are indeed off the ground. But then you might also notice the double chin. 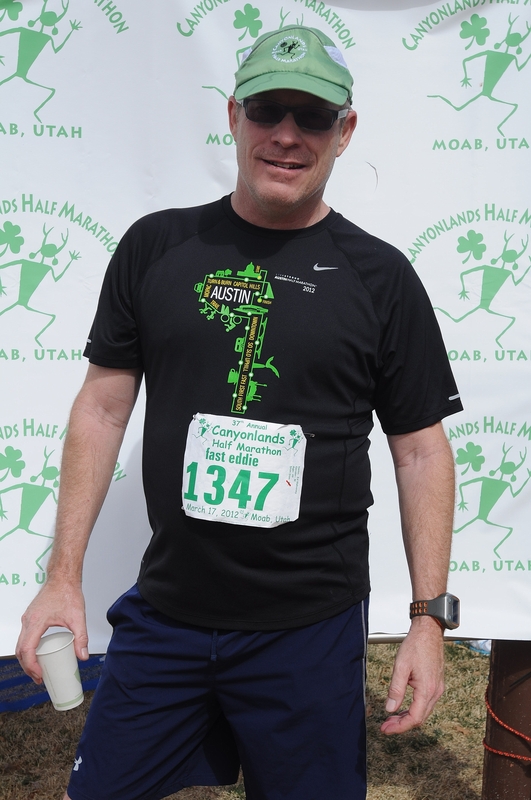 I downloaded five race pics – all capture a double chin. Still, race pics with both feet in the air is like flying in your dreams. Like unicorns in North Korea. They are magical. Those massive California rains turned into snow over Colorado and this week felt like winter. At least at the start of the week it did; we’re back above freezing now. I used the cold as an excuse not to run. I actually don’t mind the cold, especially when the sun is shining, but I balk when the cold is combined with strong wind. I used being busy at work as an excuse this week too. Emphasis on the word excuse since I think I just didn’t feel like running this week. I don’t think I’m burned out. Maybe I just shifted my focus to preparing for the holidays. Those Christmas cards don’t sign and mail themselves. The holidays present additional tasks. Apparently I sacrificed my running. That’s okay. No upcoming races to condition for, and friends and family in Texas will be disappointed if I don’t show up with my traditional paunch. To wit, I’ve been eating more Christmas cookies than Santa this week. Nothing goes better with coffee than Danish butter cookies – except maybe Gadget Girl’s coffee cake but that’s hard to say since she only talks about it. I’ve yet to have any. With Fridays off this month though, I was able to get in a nice run today. I returned to Heil Valley Ranch – the southern trail head near the Greenbriar restaurant – to run the Wapiti Trail. I didn’t get out to the trail head until noonish. Hearing the news of the Sandy Hook shooting sort of slowed me down for the day. I spent the morning watching CNBC as I finished up the Christmas cards. I wasn’t surprised to discover no snow or ice on the trail. I’d be fine either way but what I really appreciated was that there was absolutely zero wind. I wore a light fleece shell over two t-shirts and found myself quickly rolling up the sleeves. And shortly after I began to carry my fleece cap in my hand. I brought gloves but left them in the car. With the temperature around 50° or so, this was ideal running weather. Almost unbelievable to have a day at this time of year with zero wind. I probably ran close to ten miles – at least eight. I didn’t time it but the Wapiti Trail adds up to five miles up and down, plus I ran the Turkey Trail Loop and a mile on Picture Rock. Funny thing about not running for seven days. My body began to hurt after a few days off. My knees and especially my feet and ankles were just as weak and sore from not running as from running. Some sort of reverse growing pain process kicks in after a few days. As my muscle tension relaxed, my ankles became as weak as when I increase my distance. I have to be very deliberate when I get out of bed and hold the hand rail as I descend the stairs in the morning. There’s a bit of pain associated with this but mostly just weakness. Stability comes after a few steps. It’s an interesting thought that it can hurt as much to fall out of shape as to gain the initial conditioning. Bodies in motion want to stay in motion. I ran slow to recognize my legs lost some stamina, but my breathing was fine. You can’t lose a year’s worth of aerobic capacity in one lax week. Fairly relaxing day overall. I didn’t have any stressful work issues arise over email so it really was a vacation day. Fantastic run really but this school shooting has me at a loss for words right now. We have a Christmas party to go to later tonight. Hoping that’s a pick-me-up. I don’t normally use this blog as a soapbox but will go on record to share my belief in the need for gun control. I’m not a gun owner but respect the rights of sportsmen and believe we need to support the U.S. Constitution. But be pragmatic. Guns don’t kill people but they are for killing. Semi-automatic weapons aid killing to an unacceptable degree in a society of 300 million citizens. I support gun control. 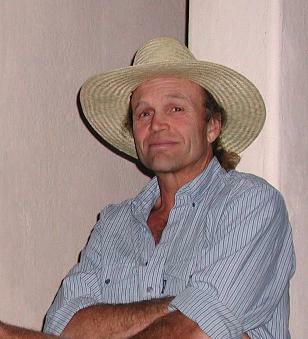 Met up with Enrique, an old friend, yesterday for drinks at the West End Tavern. We caught up while enjoying a view of the Flat Irons from the rooftop seating. Enrique said his parents, whom I care for as deeply as my own, are virtual fountains of youth and doing well. That was nice to hear. We had a pleasant happy hour, then he drove to DIA and I went home to the family. Drove Ellie to a sleep-over and then it was just Karen and me – and the dog. Around ten in the evening, Karen decided to practice her Zumba routines on the living room hardwood. She was working mostly on “Proud Mary”. I sat on the couch and watched. I rose the next morning at 6:15 and felt great. Winter is over, and so are three half marathons. Four months into twenty-twelve, I’ve discovered some weight gain from an ever slowing metabolism is affecting my performance. I’ve discovered a few other things as well. How to lose weight. Minimalist running shoes. Chia seeds. And a leaky Camelbak. Today was a test run on some of these topic areas to prep for next Saturday’s CPTR. I can remember Karen telling me before we were ever married that I would suffer the sins of my fast metabolism. That my eating habits would make me fat once my metabolism slowed down because I wasn’t learning healthy diet discipline while I was young. I scoffed at her bruja predictions and married her anyway. Twenty-five years later Karen weighs the same and, well, I’ve gained more than one pound per year of marital bliss. I used to always be able to start running and get it back under control. Now, I’ve had to moderate my calories derived from alcohol and increase my running mileage. Three and four miles do nothing, it takes a good six or more to stoke my fire nowadays. That’s fine, I like running. And I’ve had some success recently at driving back the beast within my belly. Today’s 14 miles burned nearly 1800 calories and afterward I weighed 180. Nice progress. The shoes were today’s big gear test. Most advice I’ve received regarding running with barefoot or minimalist shoes as I am now suggest running in them for 2 to 3 miles perhaps every other day. I’ve worn them on every run since I bought them last Sunday. I didn’t run every day this week – too busy – but I started out with 4 miles and worked my way up to 7. My calves felt it but they would loosen up enough to run again the next day. The question today is, could I run 14 miles on a rocky trail with my Merrell Trail Gloves? If so, then it will add confidence to my plan to wear them for Saturday’s 25 mile trail run. The other test project has to do with chia seeds. True to plan, I’ve been eating them all week. I don’t know if they’ve helped me necessarily. It’s hard to feel. But when I consider that I’ve run with these minimalist shoes all week – shoot – maybe the seeds are helping. I simply followed the chia fresca recipe during the week. That involves a couple of table spoons of seed in a ratio of 7:1 water sitting for a few minutes in the fridge. It gels up a bit into the base for Iskiate. First I drank it as is. There’s no flavor but the consistency isn’t all that great. So I quickly evolved the drink into a Chia Fresca by adding Gatorade. Not bad. Today I made my first smoothie with the seeds. This is definitely the way to go but I’ll probably only do it on weekends, or maybe later in the summer as it gets hotter. I added a banana, a tangerine, a dollop of blackberries. Basically any fruit sitting around the kitchen. I topped it off with ice, Snapple’s apple juice and the Iskiate. When are smoothies not good? I had this after today’s 14 miler. Other gear that got tested today included a new Camelbak Ultra hydration running vest. My old one burst on this trail last weekend. The new one worked out nicely. It contains a 2 liter (70 ounce) hydration reservoir. I only drank half the water which isn’t enough. Rule of thumb calculations suggest I should drink 15 ounces per hour. That would be 45 ounces for today’s 3 hour run. I tend not to hydrate enough but this wasn’t too far off. It does tell me that I’ll be fine carrying 2 liters for Saturday’s 25 mile run. I expect to run it somewhere around 5 and a half hours. I’ll also plan on drinking at the aid stations. Hopefully their drinks will be chilled. 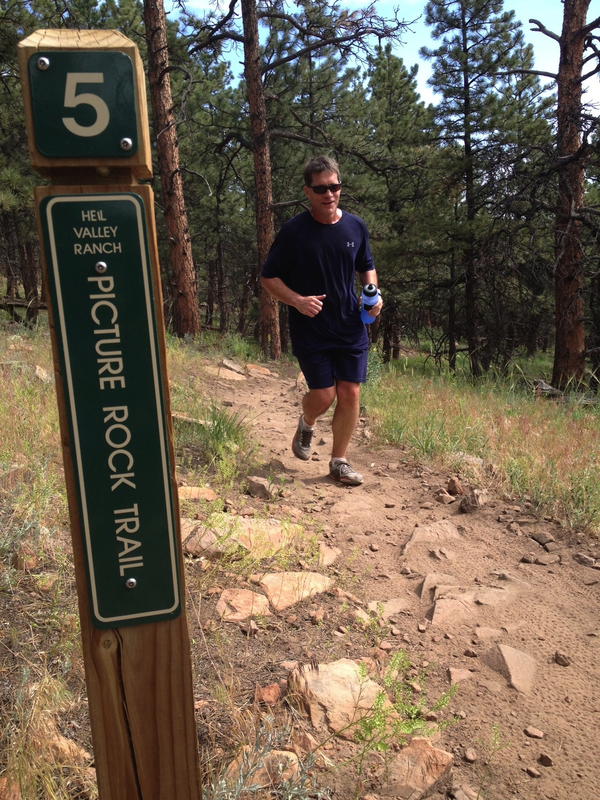 Today’s run was on the same Picture Rock Trail in Heil Valley Ranch that I ran 11 miles on last week. My pace was nearly a minute slower overall at 12:30 per mile but I actually ran the first 5 miles quicker than last week. The Garmin site offers a nice compare feature for multiple activities. I’ve found my trail legs and these Merrells seem to help. I focused on lifting my legs and trusted my feet to land safely among the rocks. It’s a good sign of my trail experience that my feet found the right surface with each stride. These shoes help as they almost force you to land on your forefoot. Feet need to work independently on trails and I feel that these minimalist shoes aid that process. I did step on pointy rocks a couple of times with my heel. This hurts but it was rare. My feet became a bit fatigued though. I think this is why I returned slower than last weekend. More so than the 3 extra miles. I was barely breathing on the return decline but my feet were becoming too tender to blaze downhill. I’ll monitor my progress next week but the plan of record is to wear these shoes for the CPTR. I finished up today feeling strong other than fatigued feet. I stopped off at the Black Bear Hole in Lyons to soak my feet and calves in the St. Vrain River for an icy bath. I credit that with my recovery today. Gotta get up the strength for a neighborhood party tonight. I laced up my training shoes as Karen pulled up in the car – returning from teaching a Zumba class. A little after 1pm. 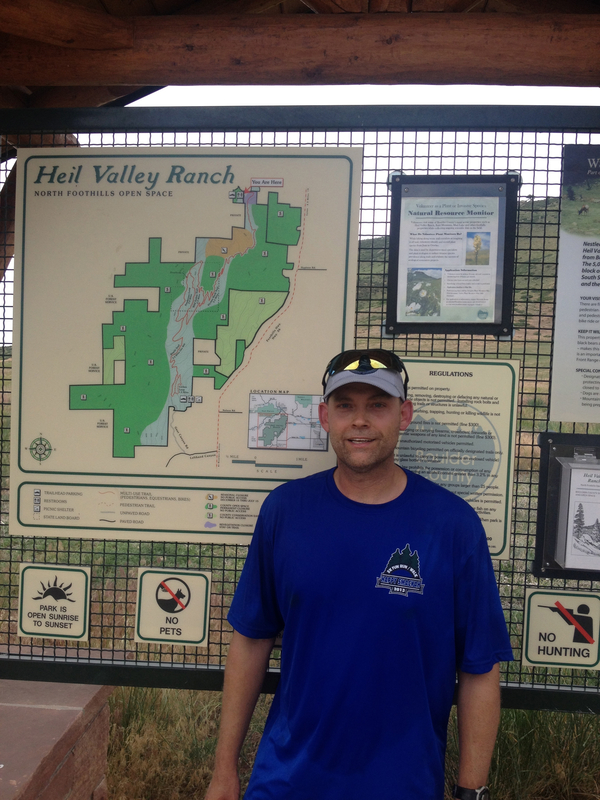 I was seriously itching to hit the Heil Valley Ranch trail today for a big run. Partly because the front was expected to hit any minute. I would be fine in the rain and snow but my weather channel app showed the wind increasing steadily with each passing hour of the day. The other reason for my impatience was I just couldn’t wait to get out on the trail. I might be picking up a little addiction to the endorphins. Most of my runs go for an hour or more now. That’s enough time to fire up a nice runner’s high. My runs are becoming a nice little habit. Today’s 10.5 mile run was exceptional. I got to the trail head a little before 2pm. I’m prepping for a mountain trail run in two weeks and decided I would use my weekend runs to replicate the race as much as possible. I wore my small pack with a 2 liter camelback. I added cytomax to the water. And I brought along a selection of running clothes to make the last minute decision on what to wear. The weather was cool and breezy, but no rain or snow yet. It will definitely be storming before I finish this in 2 hours. I layered shirts with a summer-thin Under Armour long-sleeve high-tec fabric underneath covered with a light fleece pullover. The thought was the undershirt would whisk away sweat into the outer garment. This ensemble performed perfectly. I simply wore shorts for my legs. This was comfortable starting out although I pulled up my sleeves after two miles. This course is great prep for Buena Vista. It rises non-stop until I decide to turn around. I turn after 5.5 miles where there’s a sign noting the trail joins a loop near the crest of the hill. My garmin actually shows this to be 5.25 miles. This garmin result link shows all the stats. You can see how the course rises from 5400 feet to 6400 feet where I turn. 1000 feet in elevation change over 5.5 miles. The CPTR rises 1000 feet in 9 miles – including a 200 foot drop on the 7th mile. So the steepness of the grade will provide decent conditioning to my legs. Then the rocks on this trail require constant vigilance. I decided against listening to a playlist so I would focus on the trail. The attention required for each footfall, thousands of repeating footfalls, is almost hypnotic. I could have run forever in this ultimate escape. You have to plan each foot placement on the rocks in micro seconds. When a decision to yield to bikers coming the other direction must be made, I make it at the last possible second. So do many of the bikers. I generally feel like we can both pass without anyone stopping. The bikers were aggressive today and few ever yielded. I rarely yielded as well, especially as I was flying down on the return. Hills, footwork, gear testing, but the best part was the total escape of the run itself. I felt great. Testing my gear was brilliant. Turns out I have a leak in my camelbak. I’ll pick up a new one tomorrow at REI. The drink leaked out over the back of my shorts. As the wind and cold increased near the end of the run, I got a bit chilled. So the dry clothes in my car came in handy. Good test run. In honor of the Caballo Blanco, pictured above, this will be the summer of mountain trail runs. I’ll be training on trails every weekend that I’m not actually running a trail race. My first will be the Collegiate Peaks Trail Run on April 28th. I could feel Caballo Blanco’s spirit on the trail today. Hope to see him again tomorrow when I climb the Amphitheater Trail up the Flat Irons in Boulder. It should be snowing.